Our IT and Cyber Security Assessment deliverables are very valuable to your business… and guess what? We're doing them for free if you sign before tax day! Why is Nocserv giving this away for free? 2. When we run our assessment we gather all the relevant information that allows us to make strategic recommendations based on facts. 3. Because we know our deliverables will really help out these businesses that might be struggling to get control of the their IT. What makes our assessment so valuable and different than most IT assessments on the market is that we focus just as much on the business operations as we do in the technology. Our Network Analyzer tool collects all the data on the users, devices, and applications so we are able to understand what IT is currently in the business. But it is through our interview process where we uncover what really matters which is the processes that run the business, the people that carry out those processes, and the short-term and long-term strategies of the business. We are then able to take all that data and information and put it into a comprehensive report of findings that offers a high level overview of the companies existing IT posture and some recommendations. Everything in our report is expressed in terms of business risk and cost in the executive section. Then there is dozens of pages of details about the technology that we also provide as a deliverable. At the end our assessment, we will present our finds and recommendations and provide the reports. 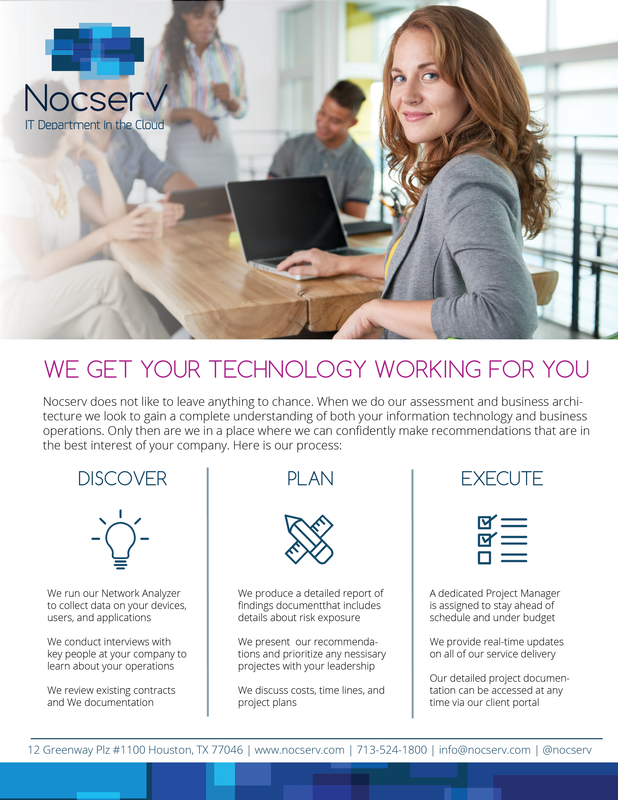 There is no obligation for the company to business with Nocserv, however we would hope to be considered to provide any necessary IT services or strategic sourcing of hardware and software that came out of our recommendations. Currently our assessment is for businesses located in the Houston metropolitan area and is most beneficial for companies that have 15-100 employees and have little to no internal IT Staff. Please visit www.novserv.com/getstarted to sign up your company or give us a call at 713-524-1800.